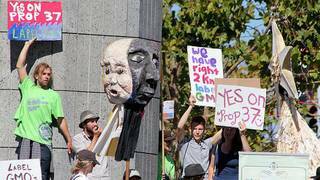 Food Fight: Debating Prop 37, California’s Landmark Initiative to Label GMO Food | Democracy Now! a longtime advocate for environmental health and spokesperson for the Yes on 37 California Right to Know campaign. She’s author of the book Not Just a Pretty Face: The Ugly Side of the Beauty Industry. professor of agricultural and resource economics at University of California, Berkeley. He is also co-director of the Center for Sustainable Resource Development in the school’s College of Natural Resources. In Californians vote yes on—if Californians vote yes on Proposition 37, the state will become the first in the country to require such a labeling system, possibly affecting industry labeling practices across the country. Numerous items are already sold in grocery stores containing genetically modified corn and soy, but companies are not required to inform consumers. Advocates of Prop 37 say consumers have a right to know what they’re putting into their bodies. YES ON 37 CALIFORNIA RIGHT TO KNOW AD: We all have the right to know what’s in our food. That’s why so many consumers say yes to Proposition 37. It gives us the right to know if there are genetically engineered ingredients in our food, with clear information on package labels. That’s the very same right consumers in nearly 50 other countries already enjoy. Yes on 37. We have the right to know what’s in our food. AMY GOODMAN: That ad that was released by Yes on 37 California Right to Know campaign. Opponents of Prop 37 say the effort to label genetically modified food is overly cumbersome and will lead to higher grocery bills. This ad was released by the No on 37 campaign. NO ON 37 AD: Under Prop 37’s complex, badly written label regulations, some foods would need special labels to be sold in California, while others would get special exemptions. This illogical, unfair labeling proposition makes no sense, and it would increase costs for California farmers and food companies by over a billion dollars per year and increase grocery bills for a typical family by $400 per year. No wonder nearly every major newspaper in the state urges no on 37. AMY GOODMAN: Leading corporations opposing the labeling measure include Monsanto, DuPont, Dow AgroSciences, Bayer, Pepsi, Coca-Cola, Nestlé and ConAgra. By some accounts, opponents of labeling are spending an estimated $1 million a day to quash the measure. Well, for more, we go now to Berkeley, California, to the University of California, Berkeley, where we’re joined by two guests for a debate on Prop 37. Stacy Malkan is a longtime advocate for environmental health, spokesperson for the Yes on 37 California Right to Know campaign. She’s author of Not Just a Pretty Face: The Ugly Side of the Beauty Industry. And David Zilberman joins us, professor of agricultural and resource economics at the University of California, Berkeley. He’s also co-director of the Center for Sustainable Resource Development in the school’s College of Natural Resources. Stacy Malkan and Professor Zilberman, we welcome you to Democracy Now! Stacy Malkan, why do you support Prop 37? And can you explain to us, since you’re one of its spokespeople, how did it end up on the ballot? STACY MALKAN: Well, Proposition 37 is very simple, Amy. It’s about our right to know what’s in the food we’re eating and feeding our families. It’s about our right to decide if we want to eat food that’s been fundamentally altered at the genetic level, by companies like Monsanto, to contain bacteria, viruses or foreign genes that have never been in the food system before. And genetic engineering has been hidden from American consumers for two decades. Sixty-one other countries require labeling laws, but we haven’t been able to get labeling here because of the enormous influence of Monsanto and the chemical companies. STACY MALKAN: —won’t raise costs. It won’t increase bureaucracy. And also, I wanted to say, just part of the ground troops are, of course, the special interests like professors, such as Dr. Zilberman, who work at universities that are being flooded with money from the biotech interests to fund the research agenda to prop up their vision of a food system that’s chemically dependent, genetically engineered and owned by the corporations. AMY GOODMAN: Professor David Zilberman, why are you opposed to this ballot initiative? Why are you opposed to requiring the labeling of genetically modified foods? DAVID ZILBERMAN: I oppose to this—to this ballot for several reasons. Of course I am for people’s right to know, but in the same way that you can label G-modified food, you can also label non-G-modified food. And today, if you don’t really want G-modified food, you can buy organic, and there are also voluntary labeling of non-G-modified food. I think that, generally, in every food system, you have some element of a mainstream food, things that are not being labeled. We don’t label most of the pesticides. We don’t label a lot of other material—a lot of other materials in the food. And to some extent, we have a system that—that provide a testing of what we eat. Whenever you have something that doesn’t work, people try to ban it, if there is a lot of testing. The system is far from perfect. But generally, people don’t—don’t have information about everything on the system; it’s only calories and the other nutrients. But more importantly, I think that the proposition, beside being costly, and it’s not written right, it’s based on a wrong premise. Almost all the food that we eat is genetically modified. If we label, there are pesticides that are much worse than genetically modified food. Actually, there was a study by the National Research Council that found that genetically modified food is, on average, less risky or at least as risky as conventional food and organic food. If it will be up to me, I probably will take more risk eating organic than a genetically modified food. The accusation that people like myself are working with corporations is basically not true. I personally got much more money from environmental group than the $3,000 that I got for a trip to give a lecture for Monsanto. To me, to think about the world without genetically modified food is basically thinking about killing people and poisoning the environment. I think that we have the proposition aimed to stop genetically modified food and—because a lot of people are really not aware about—about what it means. If they look at it, most of the people really don’t care. If people care, they can take—they can—there are voluntary labels to avoid it. And it’s a complaint that aims to frighten people. AMY GOODMAN: What do you mean—what do you mean, there are voluntary measures to avoid it, if people care, and they want to find out whether their food is genetically modified? AMY GOODMAN: Well, let me—let me put some of your arguments—let me put your arguments to Stacy Malkan. What about these points? Most people don’t care? STACY MALKAN: Well, people do care, and that’s why we’re seeing a grassroots movement in California and why nearly a million people signed petitions to get this on the ballot. There are huge question marks over the safety of genetically engineered foods. There’s no required safety testing in the United States. Almost no long-term health studies have been conducted. And numerous short-term studies showing impacts in animals that eat genetically engineered foods—links to allergies, immune system issues, toxicity of various organs. So, it needs to be studied with long-term, independent, rigorous research. But, in fact, Monsanto and the patent holders get to control the research. That’s one problem. So there are health questions. AMY GOODMAN: Well, let’s put that point—let’s put that point to Dr. Zilberman, because you said, Dr. Zilberman, that people should be more concerned about pesticides in their food than GMO foods. What about adding pesticides to the labeling? And what about Stacy Malkan’s point that genetically modified foods require more pesticides? AMY GOODMAN: —is the Monsanto pesticide. AMY GOODMAN: Dr. Zilberman, how would this law—how would this law impact that? So, let’s say genetically modified food, you’re saying, is good for people. This just says that the consumer should know what they’re eating. AMY GOODMAN: But again, how would labeling—how would labeling prevent any of that? If genetically modified food is good for the planet, as you argue, so be it. This just says you know what you’re eating. People don’t usually want to go to the internet or try to figure out what it is that they’re eating. If it’s right on the label, it just makes it much easier. AMY GOODMAN: Stacy Malkan—let’s get Stacy Malkan’s response to that. STACY MALKAN: Well, if genetically engineered foods actually had consumer benefits, I think we would already see labels. But they don’t. It’s a pesticide scheme. That’s how genetically engineered crops are being grown right now. He mentioned Roundup has been a benign tool. There are some issues with it. But now it’s no longer working, and they’re going to even more toxic pesticides and proposing to use 2,4-D, which was a component of Agent Orange. It’s not increasing yield. It’s not feeding the hungry. It’s increasing pesticide use in the United States, where it’s mostly being grown by massive amounts. AMY GOODMAN: Professor Zilberman, you say there are things worse than GMOs, genetically modified foods, like pesticides. What about also calling for labeling for foods that contain pesticides? AMY GOODMAN: How will labeling—how will labeling prevent—how will—I still don’t understand how will labeling prevent people from developing other kinds of foods. It’s just letting consumers know what it is they are eating. AMY GOODMAN: Let’s go to that issue. Let me ask Stacy Malkan about this. Dr. Zilberman mentioned wines won’t be labeled. What are the other foods that will not be labeled as a result of the ballot initiative, Prop 37? STACY MALKAN: So, alcohol is exempted because it’s labeled under different rules. It also doesn’t include restaurant foods or cows that eat genetically engineered foods, although meat would be labeled. And that’s something that the opposition is misrepresenting in commercials all over the place. It was made to follow the lead of European countries and many other countries that have the same exemptions, because we didn’t feel we should leapfrog over them, and we’ve been trying to catch up with them for 15 years. But I’d like to address the misinformation that’s coming out of the No on 37 campaign. This is a shameless, deceptive campaign, as evidenced by the fact that they were forced to yank their first ad off TV by Stanford University, because they misrepresented their top scientist as an M.D. at Stanford, Henry Miller, when his actual title is a researcher at the Hoover Institute, which is a right-wing think tank at Stanford University. He’s the one all over TV telling people that the exemptions make no sense. Well, this is a man who wants to bring DDT back to the United States. He has fronted for the tobacco industry, for climate change deniers. And he’s said that low levels of nuclear radiation could be good for us. This is the man who’s on TV every hour of every day across California telling people that Proposition 37 makes no sense. If people knew what was actually behind this campaign, it’s a trail of tricks, deceits and lies. They were accused by the Academy of Nutrition for misleading voters by misrepresenting that group in the voters’ guide that went to 11 million voters. We reported them last week to the Department of Justice, because they put—they quoted FDA saying something they never said, making it look like they were opposed to Prop 37. They put FDA’s logo on it and sent it to voters. I mean, this is a group of companies that is desperate to do anything they can to convince voters to vote against our right to know what’s in our food. And it is having an effect on the polls, but I truly believe that voters, when they go to the voting booths on November 6th, are going to value our right to know what’s in our food and vote yes on Prop 37. AMY GOODMAN: Final word, David Zilberman, the issue of simply consumers having a right to know. Maybe they won’t know about everything from this legislation, but it’s a beginning, as you said, at 70 percent. AMY GOODMAN: But I want to thank you both very much for being with us, Stacy Malkan, longtime advocate for environmental health and spokesperson for the Yes on 37 California Right to Know campaign, author of Not Just a Pretty Face: The Ugly Side of the Beauty Industry, and who you were just listening to, Dr. David Zilberman, professor of agricultural and resource economics at the University of California, Berkeley, also co-director of the Center for Sustainable Resource Development in the UC Berkeley’s College of Natural Resources. When we come back, we’ll be joined by the well-known journalist Michael Pollan.